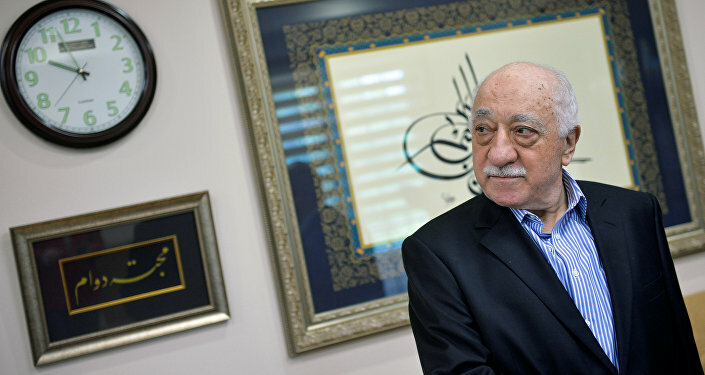 WASHINGTON (Sputnik) - Islamic cleric Fethullah Gulen’s movement that once claimed three-to-six million members is now "finished" in Turkey, but contains a ghostly, insubstantial afterlife in the country, University of Utah Political Science Professor Hakan Yavuz told Sputnik. "In Turkey, the Gulen movement as a structure is more or less finished, but the soul, the spirit of the moment is still alive. … The ghost is there. This ghost will not go away until Turkish society has some kind of reconciliation," Yavuz, co-author of the just-released book "Turkey’s July 15th Coup: What Happened and Why," said. Ankara refers to the Gulen movement as the Fethullah Terrorist Organization (FETO) and has accused the movement of being behind the attempted 2016 coup. "The future of the movement in Turkey is finished more or less. As a political force, it is finished, but its impact is there in Turkey. … Globally, I think the movement will remain [a] relevant organization," Yavuz said. Outside of Turkey, the Gulen movement continued to enjoy some support from some governments and groups, Yavuz observed. "As long as they continue to support the Gulen movement, it will remain [a] dominant force in Europe, in the United States as well, because both, the American government and the European Union, especially Germany, they support the Gulen movement," Yavuz said. The United States and Germany, as well as some other European governments were likely to still view the Gulen movement as a valuable pawn to use against Turkish President Recep Tayyip Erdogan, Yavuz maintained. "I think the Gulen movement is a useful tool for these governments against Erdogan. And also the Gulen movement provides these governments to frame a different type of Islam, the Islam which is friendly toward Europe and the United States at the same time," he said. Yavuz pointed out he had no doubt the Gulen movement plotted and launched the 2016 coup plot that tried to topple President Erdogan. "Yes. The coup was carried out, masterminded, planned and organized by the Gulen movement, because Gulen movement had so much power they didn’t want to lose their power, and they used their last bullet to hit Erdogan. So, it is a Gulenist coup," he said. Yavuz also said that the coup plotters had wanted to kill the president of Turkey. "Erdogan wanted to stop them, push them away, so they used a coup to get rid of Erdogan and kill him. The evidence is that there [were] prominent Gulenist followers and leadership involved in the coup, and the Gulenist networks also supported this coup," he said. The confrontation between the Gulen movement and Erdogan’s ruling Justice and Development (AK) Party was so intense that they reached the point that the conflict was inevitable, Yavuz explained. However, there was still not much hard evidence to link Gulen himself to the coup, Yavuz acknowledged. Moreover, "Gulen has always been a close ally of the United States, so they don’t want to give him up," Yaviz said. Other factors had also led to an unprecedented crisis in relations between Turkey and the United States, Yavuz noted. "Turkish-American relations collapsed. Not because of Gulen, because of other factors. Trade with the United States doesn’t exist, but there is trade with Russia. Russia is [Turkey’s] second trade partner. So, Turkish-American relations based on security, that foundation is gone, finished. There is no way the relations could get better," Yavuz said. Former US diplomat and former adviser to Republican leaders in the US Senate Jim Jatras agreed that US policymakers did not share the Turkish assessment that Gulen was behind the 2016 coup plot. "I am not aware of any real evidence that Gulen was behind the coup attempt — or any definitive basis that exonerates him. Given Ankara's increasing estrangement from Washington it wouldn't make sense for the United States to hand him over to Erdogan," Jatras said. Jatras also agreed with Yavuz’ assessment the US government was likely to want to keep Gulen and to use what remains of it as leverage against Erdogan. "It would be preferable [for US policymakers] to keep him in reserve as an asset for future developments," Jatras said. In July 2016, more than 240 people were killed and nearly 2,200 were wounded in the attempted and ultimately unsuccessful military coup in Turkey. The Turkish authorities introduced a national state of emergency following the attempted coup. Ankara has accused Fethullah Gulen and his movement of masterminding the attempted coup and has arrested thousands of military personnel, activists, officials, journalists, legal and educational workers over suspected links to the group. Gulen, who has been residing in the United States since 1999, has repeatedly denied the allegations of being behind the coup in Turkey.